From protest songs in the 1960s to musicians performing at both the Democratic and Republican National Conventions, arts and politics have mixed before, during and after election season — both on a national and local scale. The song was in part a response to comments that Republican presidential candidate Mitt Romney made off the record about voters who he believed were "dependent on the government" and "entitled to health care, to food, (and) to housing." “(The song) voices a lot of disenfranchisement with heteronormativity,” Warpigs said of the song’s origins, noting how the political environment had affected them personally. Warpigs said the internet also plays a role in introducing young voters to new concepts. “You get to high school, and it’s a bigger pond, and you get to college, and you get on the internet, and you have all these new ideas and they’re all really fresh to you, and they’re all like really big,” Warpigs said. During this political season, Warpigs noted that they had seen more “elaborate stunts” (like fake protests) and more “heavy music and experimental noise music,” too. The local arts and culture scene, from music to theater, has been a soundtrack and backdrop to young voters, many of whom will vote for the first time in the upcoming election. Maldonado is 18 years old, and this is their first presidential election. Although this is their first election, Maldonado is aware of the issues, in part due to the local arts and culture scene, they said. Maldonado frequently cited a show they were at where Nick Perkins, a local hip-hop artist, performed and took a moment to address the Black Lives Matter movement. The local music scene tends to be more liberal, according to both Warpigs and Maldonado. However, other arts and culture in the Valley is aiming to inform young voters without bias. Space 55, a local venue for the arts, recently put on a show called SpaceCon’16. The show included audience interaction. During the show, audience members were delegates to a fictional convention. Duane Daniels, artistic director of Space 55, said the show is not politically biased. “We tried pretty much to avoid everything," Daniels said. "There were no references to Trump or Hillary." Daniels said he had a different way of approaching the subject of politics. “(There were) no references to anything that I thought could be genuinely controversial, because then it would become politics itself," he said. "I want to make fun of politics by not really participating, but showing how absurd it is." However, Daniels noted that even though the show isn’t biased toward either candidate, it can still inform an audience. “There are lots of different ways to send your social message that could be overt in your piece or the undercurrent in your piece,” Daniels said. Many attest to the power of art to make people think and enact change. Warpigs said that art’s role is to make people think and even feel uncomfortable. “I feel like it’s the role of artists to confront society with new ideas that people aren’t comfortable with yet,” Warpigs said. This idea is particularly relevant as the political ideas in Arizona are being disturbed. Recent polls show the traditionally conservative state might "go blue" for the first time in years. The Arizona Republic editorial board endorsed Democratic nominee Hillary Clinton — the first time they’ve endorsed a Democrat in their 126 years of publication. With the shifting political climate, the music and art community is a unique place for young people to get informed. “If you’re going to these shows and going to these art events and talking to the people around you,” Maldonado said. “Chances are, at some point, they’re going to talk about something in relation to the election season or just politics in general, and you learn a lot ... No one has an obligation to make their content about absolutely anything, so it’s really special when people make content about things that are as personal as politics." 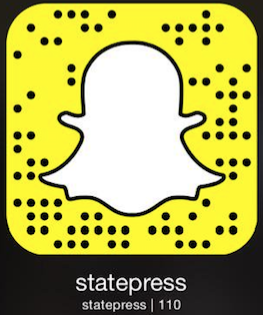 Reach the reporter at anwatts@asu.edu or follow @alexandrawatts_ on Twitter.